Christmas snuck up on me again! 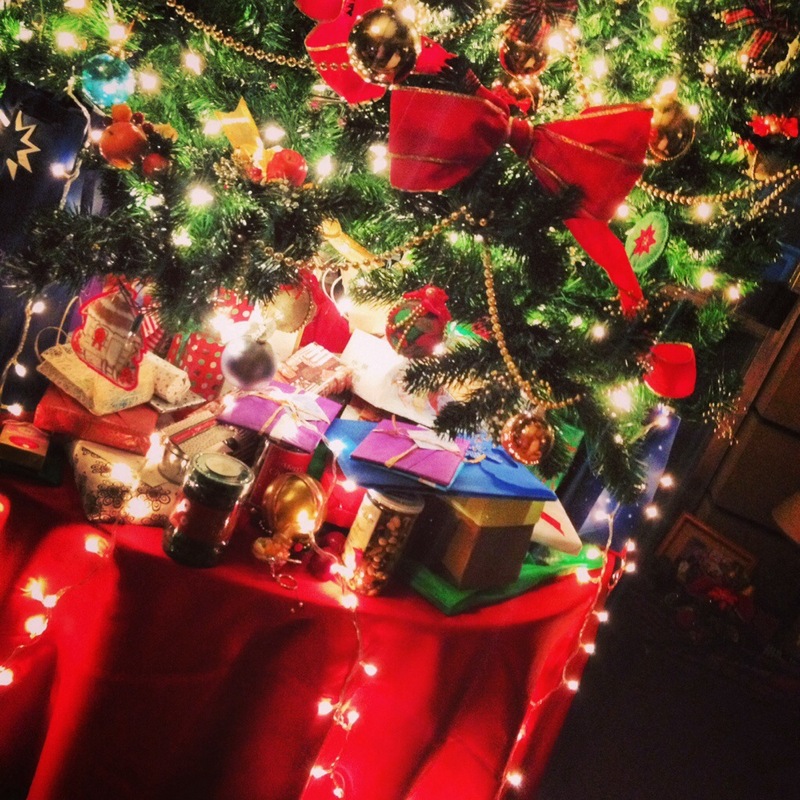 Our Aritao tree on Christmas eve! Today is one of my favorite days of the year. Christmas day may be one of the few that I leave unplanned, no to-do list, no agenda, and no expectations. After a late night of hanging out with the family, eating ham, sipping wine and opening presents, a sweetly lit Christmas eve is followed by a day at home, taking a real day off. Around Christmastime, the world has been inclined to suffer some of its heaviest hits, this year and in years past – be it from natural disaster like a supertyphoon, from discord between nations or families, or violence both intentional or accidental. These experiences cut even more pain when held in the light of celebration and the desire for peace. Despite the darkness and ruin that overcomes so many, hope endures. Victims of Typhoon Haiyan/Yolanda spend this season very differently from the last, a long way down from their expectations of Christmas cheer. Despite promises of local organizations, not all families have had their electricity reconnected since the storm, spending the holidays steeped in darkness. Many still clutch the gaping hole of loss -their first Christmas without a father, or without a home of their own. A night is haunted by nightmares of the savage flooding, and the daytime is not large enough to get lost in. Too many still survive in conditions that defy even the most basic of human needs. During this season of plenty, we cannot forget those that have little. These people are not alone in their grief. All over the world are people sinking in their sorrow. All over the world, we must hail their resilience. There is no other way. We come to You today with thanksgiving in our hearts, with worship for You on our lips, and hope rising among us. You are our light through all season, through all generations. We are in awe of You. We fall short of Your glory and acknowledge our wrongdoings, our hardened hearts and our eyes that have turned away from You. We are sorry. Thank You for the coming of Jesus, for the joy of the advent season, waiting patiently and expectantly for You. We lift up to You the families represented in our church. Whether the holidays are spent in loud cheer or silently in our hearts, whether our table sits three generations or just You Jesus, and us – bring joy to all our homes, big and small, in plenty and in little, here and abroad. We invite You in. We celebrate You. We remember those all over the world, and right in our city, struck by tragedy, loss, sickness, natural disaster, injustice, depression, hatred, hunger or pain. May the light of Your presence this Christmas push out every darkness, soothe every aching heart, every tearful child, or every family that has lost their hope. Bring your provision and joy to their place of need. Satisfy their hungry hearts. Satisfy our hungry hearts. Lastly, may Your Light, the Light that Jesus brings, shine the brightest of all the Christmas. 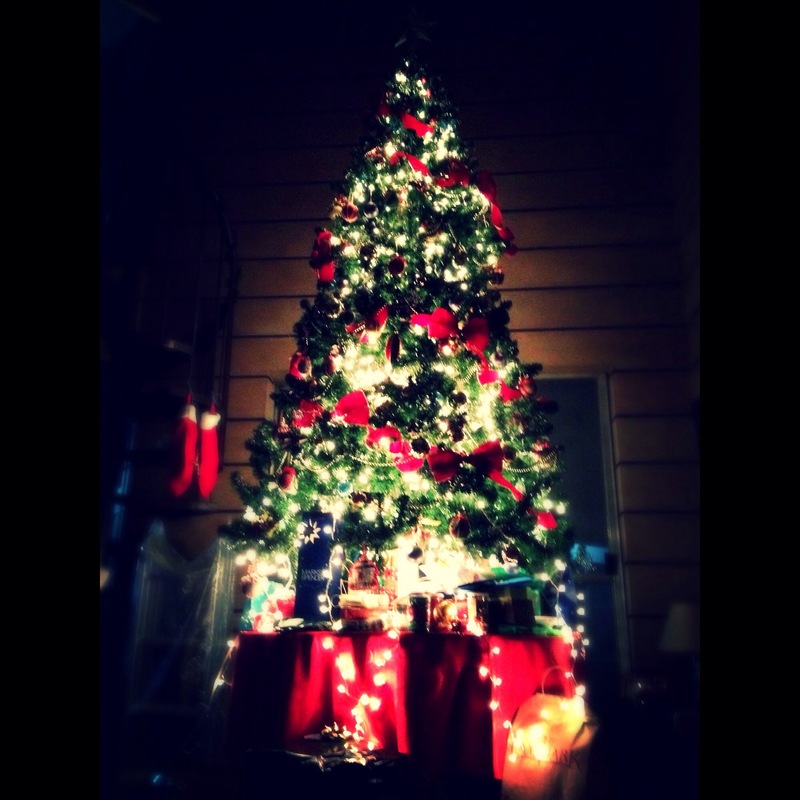 Nothing lights up this season and every season, like the King born in a manger. Family and friends, thank you for being messengers of this light too – for your generosity of company, word, gift or smile – blessings on you! Whether you celebrate Christmas or not, Merry Christmas! 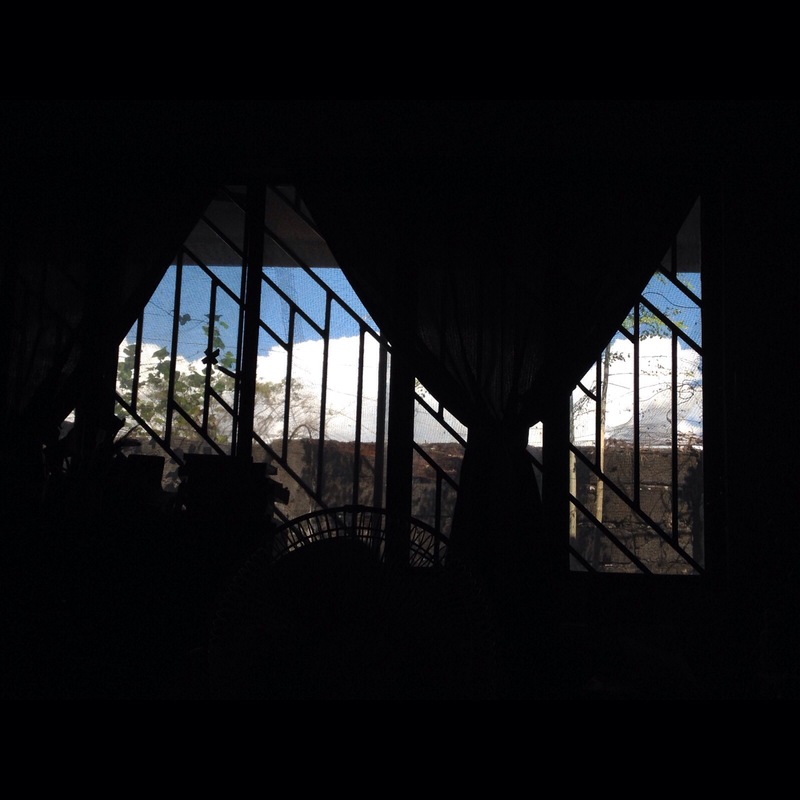 For many days over the past few weeks, I would fall asleep or wake up with the Buhay Makulay song playing in my head. I would think of our children and the joy in their faces as they sang. 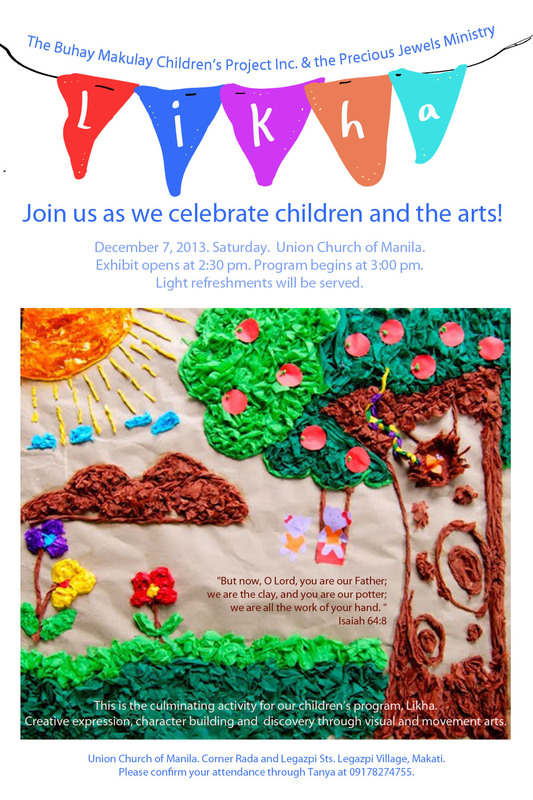 I would look ahead toward the big surprise we had for them – our special culminating activity! But the day before yesterday, I woke up with children and the song in my mind, this time harmonized with sadness. The Buhay Makulay’s first Likha season had come to an end. On Saturday, December 7th, Buhay Makulay had it’s first Likha Showcase! The showcase was a celebration of children and the arts! The showcase consisted of an art exhibit and a short program, all featuring the work of the 31 children we had been blessed to work with throughout this season. It was a private event, really more for the children than for anyone else. Each child invited one guest from their family, while we invited a few of Buhay Makulay’s and Precious Jewels Ministry’s closest friends and supporters. We gathered to honor the children and praise God! The invite I designed, featuring the beautiful and colorful paper collage made by the children who focused on visual art for majority of our program. This was the most ambitious program I’ve launched for Buhay Makulay so far. In my mind and heart it has been years in the making. The vision for the showcase I have held so long, I cannot believe it has already come true, almost exactly how I had pictured it! This was the first art exhibit I’ve ever really curated and installed, and I certainly hope it is only the first of many. It was small in scale, but gigantic in story. The activity was not just an event, but part of a larger narrative. Though us volunteers and partner staff could see the growth in the children during our time together, we were not sure that the children could yet grasp the weight of their discoveries and accomplishments. The activity was meant to help see how far they had come! This was a special day for them. These children live in cramped quarters, some under a bridge and some in relocated communities, all from the poor corners of the city. They do not have room in their homes to dance, or large spaces on their walls on which their artwork can be displayed and appreciated. This was a special day for them. All the fun and learning they had with us could finally be shared with the people that raise and care for them on a daily basis. Most brought their mothers, others their fathers, and a few their older sisters or brothers. We were sharing with family. We were making known to them their own incredible value that so often gets lost behind poverty line. This was a special day for them. The kids walked around the exhibit, pointing out to their mothers which drawings or crafts they had made. Mothers watched on bright-eyed, as their kids danced onstage. Little kids came up to our volunteers, with a wealth of smiles that many weeks ago were so hard to wedge out of them. And I watched, in disbelief and wonder, at the sweet celebration taking place around me. As we knew from the beginning, all our hard work is worth it. 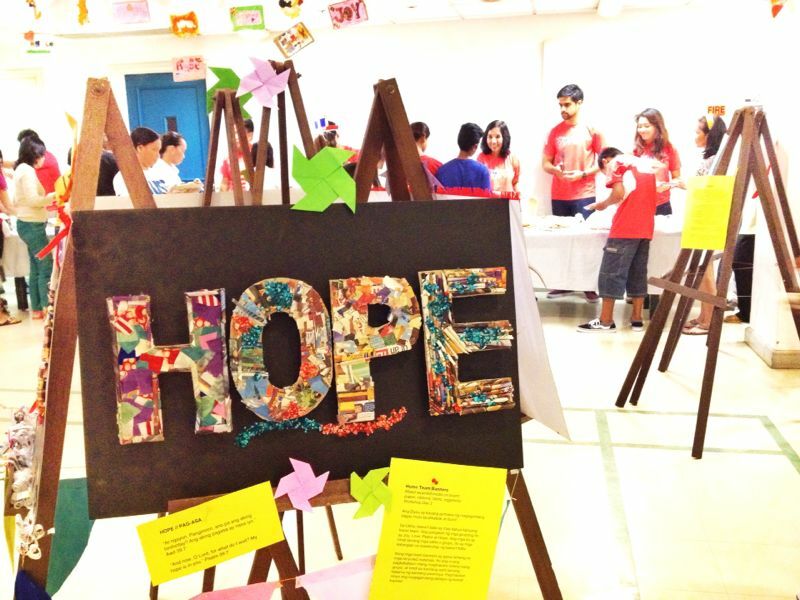 The banner of Team Hope (ages 8-10) -a collage made entirely out of recycled paper, fabric and dyed eggshells. Our children learned that beauty can be made of the scraps. God makes beautiful things out of us, out of dust.This was made on our third workshop day, before our children chose to focus on visual or movement arts. I’d rather wait in willing suspense, than just have things be plain over. Perhaps this is the feeling that I woke up with the other day – wishing we were still looking ahead to the big surprise for the kids, rather than knowing that the celebrations had been celebrated. In the weeks to follow, I hope to continue to process the experience and share incredible stories of learning and blessing. Thankfully, there is much to share!